Students must meet certain requirements to graduate from high school. Getting accepted into college isn't one of them. Metro education officials are reminding one of the largest charter schools in Nashville it can’t make college acceptance a high school graduation requirement. LEAD Public Schools brags all seniors in its first five graduating classes at LEAD Academy had been accepted into a four-year college. Part of that could be due to the fact that college acceptance was a requirement in its original charter application. The office in Metro Schools that oversees charters is still consulting legal experts on whether mandating college acceptance is illegal. "In order to receive a diploma from the state of Tennessee, I don’t believe you can make that a requirement," said Dennis Queen, Metro's executive officer of public charter schools. But, he says he also believes this could discourage certain students from enrolling at LEAD in the first place. "Charters do have some flexibility, but there are other things they have to receive waivers from the state for to do different, and we're waiting for a determination from Metro legal," said Queen. He says he thinks the school's mission is noble, but adds, "at the end of the day we know not every child will choose to go to college. Some may want to go to the military and some may want to go to the workforce." Education officials did ask the school to get rid of its college acceptance requirement several years ago. Dwayne Tucker, CEO of LEAD, says it complied in order to renew its charter application, but it failed to do one thing. "What didn’t happen was we didn’t go back and change the language in our handbooks, so shame on us. We corrected that once it was brought to our attention," he said. Tucker says the handbook was updated once concerns were raised. 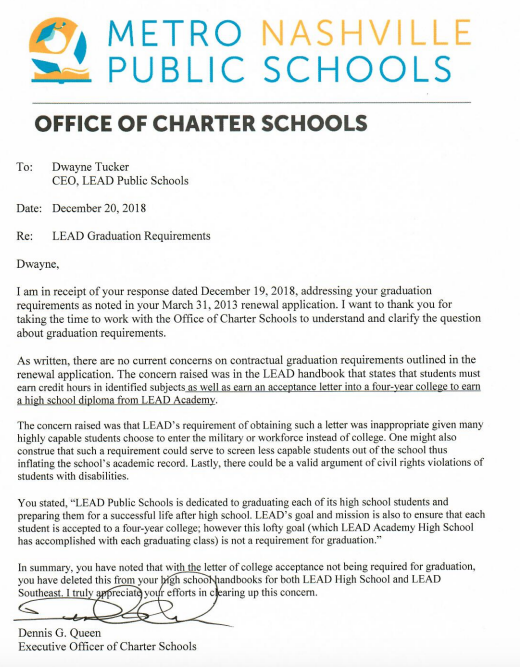 A letter from MNPS dated December 20, 2018, obtained by WPLN and addressed to Tucker says the school needs to clarify requirement language in its handbook. A letter obtained by WPLN shows MNPS contacted LEAD Public Schools about language in its handbook. Tucker says no child has been denied a diploma for failing to get into college. However, LEAD still boasts all its seniors have been accepted into a four-year school. "It demonstrates our mission and our commitment to parents who allow their kids to attend our schools," Tucker says. Charter schools throughout the country have been scrutinized before for having graduation requirements like 100 percent acceptance into college. Some education officials say many of these schools have their kids accepted, but once they enroll they often don't stay in college at exceptional rates. A report from the Nashville Public Education Foundation and non-profit education group, Tennessee Access and College Success Network, found fewer LEAD students complete their four-year college education than those who graduate from Nashville’s public schools. Metro Nashville Public Schools administrators are recommending that the board deny the only charter school application that has come in this year. In a report sent to board members this week, district officials criticized the proposal from the nonprofit ReThink Forward, saying it wasn't specific enough and the financial model was incomplete. The Martha O'Bryan Center is known throughout Nashville for its work with low-income residents and has been embedded in East Nashville's James Cayce homes for decades. As Cayce is being overhauled into mixed-income housing, the nonprofit is about to move one of its charter schools into that complex. But the new school building has received pushback from some city officials. A prominent resignation spotlights a fundamental push-and-pull in Nashville's charter school movement. Internal documents have been released related to the departure of the CEO from LEAD Public Schools.